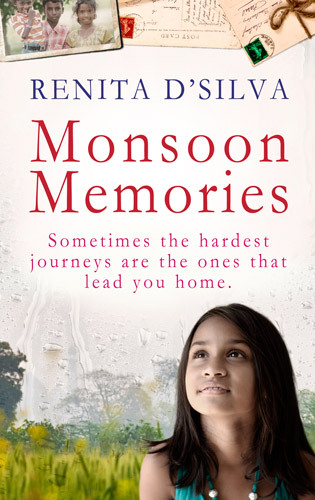 Monsoon Memories, my first full-length novel, published by Bookouture, is out now. I have always loved rain, so living in England suits me to the ground but I do miss the fury and sheer drama of the Indian monsoon. Monsoon Memories initially started as a picture in my head: Sisters sitting on the veranda as the rain drums on the tiles above and farm women plant paddy saplings in the fields below. It was to begin with a story of the two sisters, one perfect in every way, the other dumpy, ordinary, eager to please. And it sort of evolved from there. Add Monsoon Memories on Goodreads. I loved the picture of the innocent little girl and fragments of old family letters and photograph on the cover, as well as the blurry tropical background. I found it moving and evocative. Thank you so much. I hope you love the book just as much. Love the cover Renita. Thought the corner photo is of Ryan & Tanya’s. Your name in that book is so unique and beautiful, it’s really meant to be an author’s name…So happy and proud of what you have achieved..Good luck. Hi Renita, I am Rashmine’s colleague and what caught my attention was the line “Sometimes the hardest journeys are the ones that lead you home”. Looks like a book worth reading. Waiting for the it’s release. Thanks so much, Srini. Monsoon Memories is about how hard it is sometimes to go home after you have burnt bridges in the past, it is about love and forgiveness and the power of family. I think it is definitely worth reading:-) Can’t wait till June to share it with all of you. Thank you for your beautiful comment. Loy, mentioned about this book recently and I am looking forward to reading it. Good luck!! I came across your book on goodreads and was rather intrigued by it. The cover is very fresh and appealing and the plot outline holds a lot of promise. I have entered the giveaway and if I get lucky would love to post a review on goodreads and my blog. Nonetheless, wish you all the best and good luck with the book! Monsoon Memories! These childhood memories are not just Shirin’s, but the feelings of all the Indian girls in their initial years of living in London. After13 yrs in London, still India is my home. I have enjoyed reliving the childhood with Monsoon Memories. Thank you for this lovely comment, Kalpasrini. So glad you are enjoying Monsoon Memories. Thank you so very much for this lovely review, Khushboo. So glad you enjoyed Monsoon Memories. I enjoyed my chat with you too. Also, love how you have arranged the book- a beautiful photograph. Thank you. i ordered monsoon memories online ,and the moment i held the book i knew it was a good one.i read the book in one sitting and it was amazing and very touching .every character had depth and power in them ,it felt very real and shirin’s character is as large as life !real good.looking forward to read the forgotten daughter :D! Monsoon memories is very lovely book, I could myself feel the pain of shirin and reena, while reading the book. Thank you so much for taking the time to write this lovely message. I am so glad you enjoyed Monsoon Memories. Mam just read monsoon memories. An amazing out of the box story which mesmerised me. Loved all the characters particularly Reena and vinod. In complete awe of your writing!! !